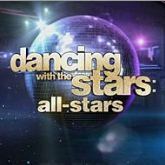 DWTS: All-Stars, Week 2: Jive & Quickstep – Here’s How They Did! This week on Dancing with the Stars: All-Stars, the focus was on the footwork as the teams competed with either a bouncy Jive or a speedy Quickstep. A few couples rose to the top, two others failed to impress, while the others landed in the middle due to lack of technique. Here’s a rundown on how they all did on this fast-paced, high-energy night! This perky duo started the night with a 50’s inspired jive that started a fight between Bruno and Len. The 50’s inspired number was fast and cute, totally suited to Melissa’s cheerleader personality, but Bruno claimed to see a few missteps. She didn’t have the sharpest kicks and flicks we’ve ever seen, but what she lacked in technique, she made up in personality. Mark’s combination of country line dance and quickstep didn’t wow the judges or the audience. Dressed in sparkly Daisy Dukes and wearing cowboys boots, Bristol could barely keep up with the slow pace of this complex dance. It often looked like Mark was dragging her around the ballroom. the dance also depended on Bristol playing a character, but she simply looked confused as she tried to get it done. Sixes across the board. Helio and Chelsie delivered an updated jive with a modern tune and a revealing costume. Carrie Ann said that this week Helio’s body caught up to the charm in his face and Bruno called the number a delicious treat. Len loved it for the most part, but warned Helio not to get overly enthusiastic with his moves. Apolo and Karina turned in a Quickstep featuring some of the fastest footwork ever seen on the show. They moved around the dance floor with incredible speed but still maintained the control needed for the precision steps that make up this old Hollywood classic. Len gave them a gold medal, and Carrie Ann said, “someone put on his competition pants.” First place for the moment. In spite of a ridiculous opening where Sabrina had to run down stairs in her high heels, the rest of the number was incredible. The dance had a modern feel but still came off elegant. Sabrina simply sparkled in her black gown and Carrie Ann said she had the best top line of any dancer on the show. Len raved about Sabrina’s calm upper body. Carrie Ann pulled out the 9 paddle and they moved into first place. Kirstie was hardly recognizable in a cropped black wig and short fringe costume. Their French street corner themed jive was slow and with barely any elements traditionally seen in the dance. Carrie Ann brings up the fact that Kirstie is the oldest contestant, then says it doesn’t matter. Len calls her flirty, dirty Kirstie and claims she gave him heart palpitations. Nice words, but in the end it all adds up to nothing but 7’s. Emmitt and Cheryl bust out with a big band tune, but there’s not an ounce of excitement in their moves. Len and Bruno say they like it in spite of technique problems and Carrie Ann throws down the gauntlet saying that the race car driver and the speed skater have Emmitt beat. They end up with an average 22.5. Joey put on his Charlie Chaplin outfit for this Quickstep inspired by the silent movies. It’s theatrical but strange. All three judges say the routine lacked technique, but Joey always sells it with his charm. Even with all the mistakes, they land in the middle of the pack with everyone else. Shawn and Derek played into their wholesome image with a number from the 50’s inspired movie Hairspray. Bruno said the dance was exhilarating and eye popping, Carrie Ann called them the All-Star Sweethearts but Len wanted to see more. They end up with one of the better scores of the night. Kelly and Val performed a sweet and romantic Quickstep that worked in the slow portions but didn’t suit the fast footwork. Bruno said he knew holding the top line was difficult for Kelly because of her ‘zeppelins’ but overall, he enjoyed it. Len and Carrie Ann disagreed on which part of the dance was better but they all agreed that it was worth a paltry 22. Gilles and Peta get the award for the sexiest jive of the night. The dance was filled with unusual moves and perfect flicks, and Gilles even took center stage for a few solo moves. Carrie Ann giggled and said that he reminded her of John Travolta, Len said it was fast and fabulous. They earn the second highest score of the night. At the bottom of the leader board are both the Chmerkovskiy brothers with partners Kelly and Kirstie, along with Bristol and Mark Ballas. Who do you think is going home? Who deserves to go home? Leave your predictions and comments below – and we’ll find out tomorrow on the Dancing with the Stars results show on ABC at 9.